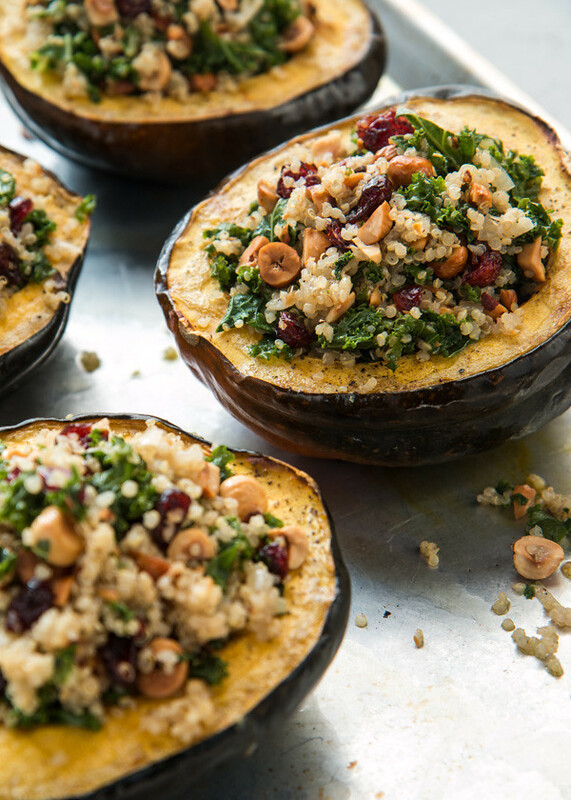 These stuffed acorn squash are hearty, filling, and naturally vegan and gluten-free. Plus, they have one of my favorite flavor combinations: roasted hazelnuts and dried cranberries! Read on, or jump straight to the recipe HERE. I like to think of myself as an equal-opportunity squash lover. I like pretty much every winter squash I’ve tried, from kabocha to spaghetti, from butterNUT to butterCUP. They’re all good, in my book. Or should I say, they’re all guard? Ha! I think I’m so funny. This particular recipe combines some of my favorite things. Squash (duh), quinoa (tons of protein), hazelnuts (somebody stop me, I think I’ve roasted five pounds this month already!) and dried cranberries (because a bit of sweetness goes a long way in savory dishes). Oh, and kale! Even if you aren’t a fan of kale, don’t run away — the flavor is barely there with everything else going on, and it adds great pop of color and of course nutrition. Speaking of nutrition, we’re a few days into these 31 Days Of Healthy Recipes now, and I realized I should probably talk about what “healthy” means to me. Everyone has their own definition of what healthy food is. Healthy could mean low calorie, or high protein, or no carb. It could mean no grains or no dairy, or vegan or paleo… or anything in between. To me, healthy food means real food. And that’s about it. It means fresh, and from the Earth (as in, minimal processed). My definition includes fats (olive oil, coconut oil, avocado, nuts, etc. ), whole grains, and meats that have been raised with care. 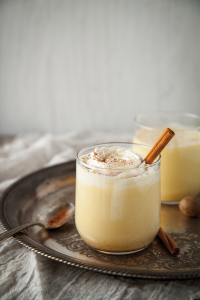 It includes local eggs, full fat dairy, and — very occasionally — honey, maple syrup, or sugar in moderation. I tend to like variety, so some meals are very light, while others are more hearty. They both have a place in my definition of healthy. So that’s what you can expect to see this month. 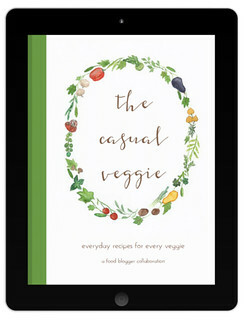 Whole food recipes, sometimes low in carbs, or gluten-free, or vegan (like this one! )… but always made from real, honest ingredients. If you have a similar idea of what healthy means, than stick around. I’ve got a lot more tasty recipes coming your way! What’s your definition of healthy? I’d love to hear it in the comments below! Preheat oven to 400 degrees F., and halve the acorn squashes lengthwise down the middle. Scoop out the seeds. Place the squash cut-side up on a rimmed baking sheet (line with foil or parchment for easier clean-up) and drizzle with olive oil. Sprinkle generously with salt and pepper, and roast for about 45 minutes, or until the squash are fork tender. While the squash is roasting, prepare the filling. In a large skillet, heat 1 TBSP olive oil. Add the onion, and cook for about five minutes, or until softened and translucent. Add the kale (or chard, or beet greens) and let cook for another minute or two, or until slightly wilted. Add the quinoa, salt and pepper, and water. Bring to a simmer, then cover and reduce the heat to low. Let cook for about 15-20 minutes, or until the water has been absorbed and the quinoa is tender. Remove the lid and fluff with a fork. Taste, and adjust seasoning with more salt and pepper if necessary. Return the squash to the oven for another 5-10 minutes. Serve hot. Recipe adapted from this STUFFED BUTTERNUT SQUASH RECIPE from Well Plated. I just started eating acorn squash last autumn. Wasn’t sure what to do with it so I just enjoyed it roasted and really loved it. Wish I had this recipe! And I need to learn the differences between butternut and buttercup too. I’m so bad about mixing up my squash game past butternut. 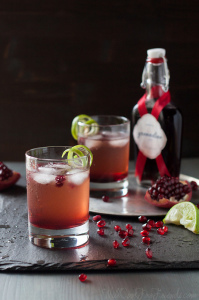 Thanks for the inspo – this looks amazing! 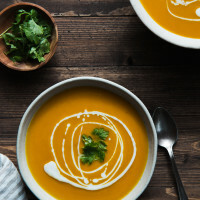 Butternut is so versatile and easy to reach for, I totally get it. Glad I could help! I am so with you on what it means to eat healthy. Eat a variety of seasonal produce and reduce intake of junk. 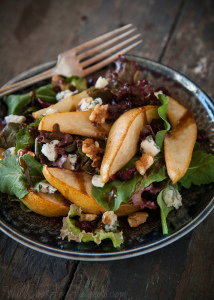 It’s sometimes easier said than done, but with beautiful dishes like this, it’s easier. 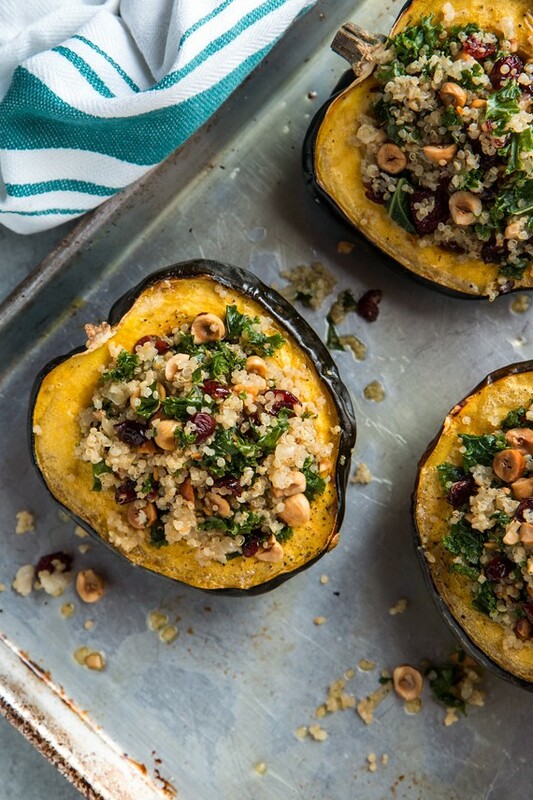 I love stuffing squash with grains and seasonal goodies. This looks just gorgeous! Thanks, Karen! Very well said, and you’re right, it’s easier said than done. January is always rough because I’m still wanting rich cold-weather foods, so it’s all about finding that balance. 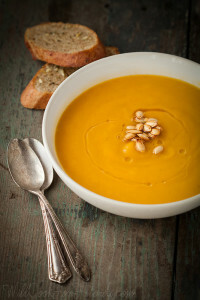 Squash plus grains is such a filling combo, recipes like this one really do help! 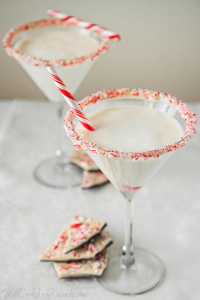 This seriously looks so delicious! I am loving the gorgeous colors and that flavor combo. 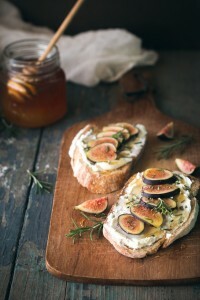 I’m especially loving the addition of hazelnuts- I have some leftover hazelnuts in my freezer that I’m looking to use! Thanks Jessy! These would be a perfect way to use up those nuts. I love all types of squash, like you! I especially like having acorn squash too. One thing that is funny is when I was growing up, we would each have a half of acorn squash with a dollop of butter and some honey. Each of us. Yikes, even though it’s delicious, I wouldn’t have that again as I like to try to eat healthy and that was too much butter and honey. 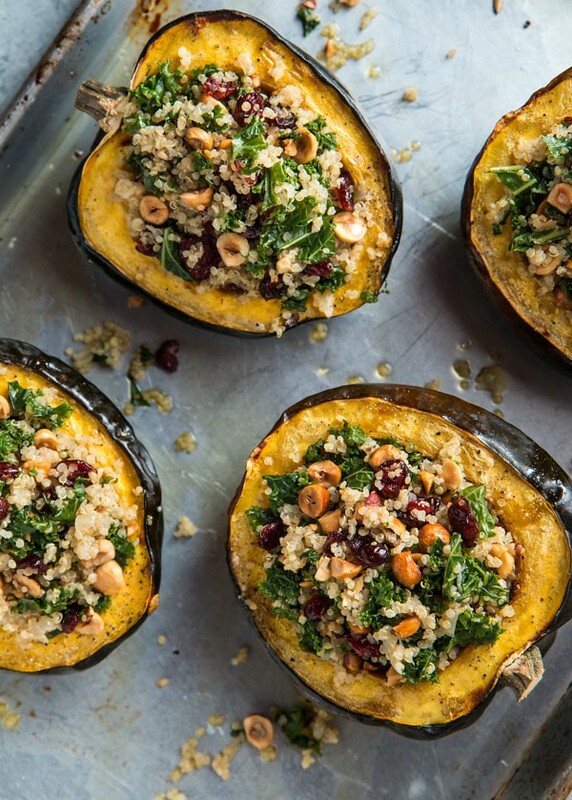 This stuffed squash looks delish! heheh, thanks, Elaine! Mmm, butter and honey does sound yummy, but you’re right, maybe a little rich. My mom always roasted squash with a TBSP of maple syrup, which is yummy too. 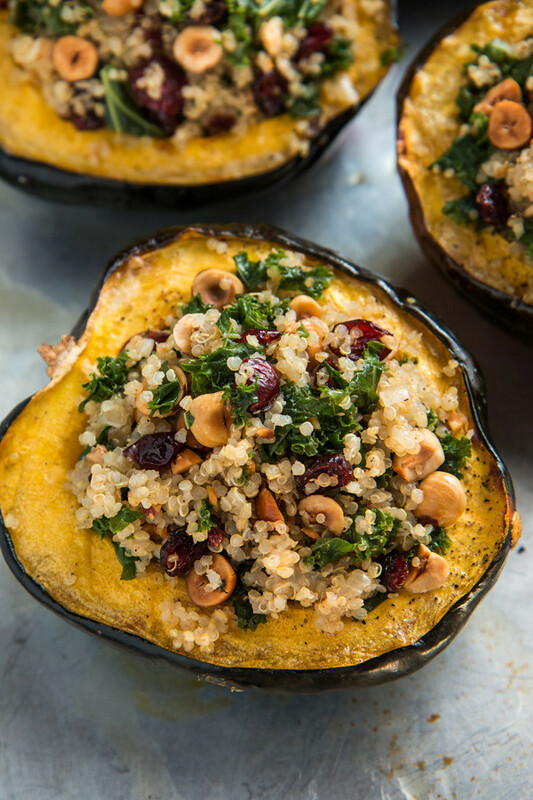 I make a very similar stuffed squash with quinoa and kale — love those hazelnuts though — crunch city! That’s awesome, Lisa! I love the hazelnuts here, but I’m kind of a hazelnut fiend. I add them to everything! I love acorn squash! So easy to make and delicious and filling. I bet the hazelnuts really bring out the nutty flavor! Hello, I came across your blog quite by accident but I’m so glad I did. This was amazing, delicious and super easy to make. Everone who had it enjoyed it immensely. Thank you, Eryn! I’m so glad you found my site, and that you liked this recipe! I am new to the vegan arena and needed something to prepare for vegan family members. I prepared this recipe for Christmas dinner and thought it was delicious and so did my family members. I also used the remaining filling as a salad topper per your suggestion and enjoyed it that way as well.